Our 2016-2017 season starts with our holiday concert, Joy and Peace. We’ll be singing some old favorites and some new pieces as well. We’ll be singing the beautiful “Laud to the Nativity” by Respighi. Last year we sang a piece by Charles Davidson, a local composer, and this year we’re singing “Maoz Tzur” arranged for us by Cantor Davidson. “Christmas at Home” by our former director, Frank Kuykendall, will also be featured in our program. 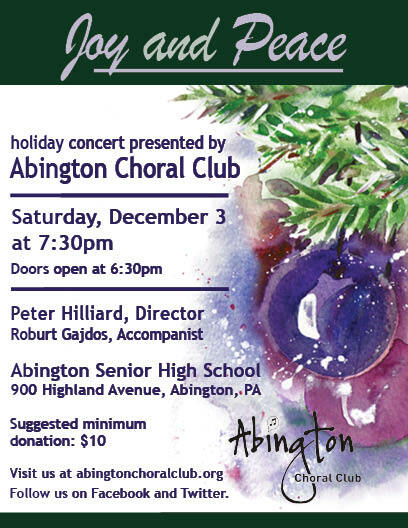 Join us on Saturday, December 3rd at 7:30 pm in the Abington Senior High School Auditorium! Bring friends and family, including children and grandchildren, to help Santa and his elves decorate our tree and join in this festive occasion. This entry was posted in Uncategorized by Chari Small. Bookmark the permalink.